This workshop is for her. 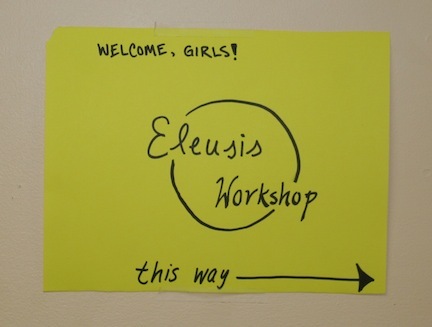 We worked within the community of Rutland, VT, to provide a summer feminist arts workshop to local adolescent girls. Over the course of four weeks, we led the girls in ensemble-building, improvisation, participatory theatre, and storytelling, safely engaging adolescent girls in otherwise risky conversations while making theoretical issues tangible and active. Through this process, we sought to help the group practice living conversations, asking questions, and interrupting negative influences. At the end of the workshop, Eleusis presented an interactive multi-media showcase housed as a pop-up event at a Rutland storefront. The workshop focused on four main elements: training, community, collaboration, and empowerment. Week 1: Body: Movement and Storytelling. Week 2: Voice: Creative Writing and Self Dialogue. Week 3: Adaptation: Songwriting and Playwriting. Week 4: Production: Playwriting and Performance. For our first artistic collaboration, we were interested in creating a large-scale multi-media project capturing the collective experience. Using our various backgrounds in performance, literary, multimedia, and devised arts, we wanted to capture the unique process of becoming a female collective, this moment in our lives as we learn how to be artists in the world, and the many ideas and artistic projects it inspires. Below is an early exploration of the multimedia project: a short collaborative letter we wrote to our sixteen-year-old selves.